When I agreed to review this book, I did not realize that it was a collection of prayers spoken and written by Christoph Friedrich Blumhardt, a pastor who lived from 1842 to 1919. This is not a new book. I just read the book description and thought it sounded like a great book to have. We want to turn to God at the end of each day, but often don’t find the words to express our deepest feelings and longing. This collection of prayers is one of the few daily devotionals especially intended for use in the evening. Blumhardt’s words bespeak a certainty in God’s nearness. The peace that flows from them comes from an unshakeable conviction that God’s kingdom is indeed on the way. In stormy and challenging times like our own, most of us need this reassurance frequently, if not daily. It was only after I'd received the book and started reading the introduction that I learned that these prayers were collected and published in 1926, after Blumhardt's death, and only intended at first for his closest friends. Since that time, Bumhardt's collection of prayers has been published multiple times, including this newly revised 2014 edition. Obviously I haven't read through the whole book - there is a scripture and prayer for each day of the year, so I've just started going through it. I started at the beginning instead of on the proper date (yeah, I know - what a rebel), but I plan to start over again and go through it in 2015, since January will soon be here. 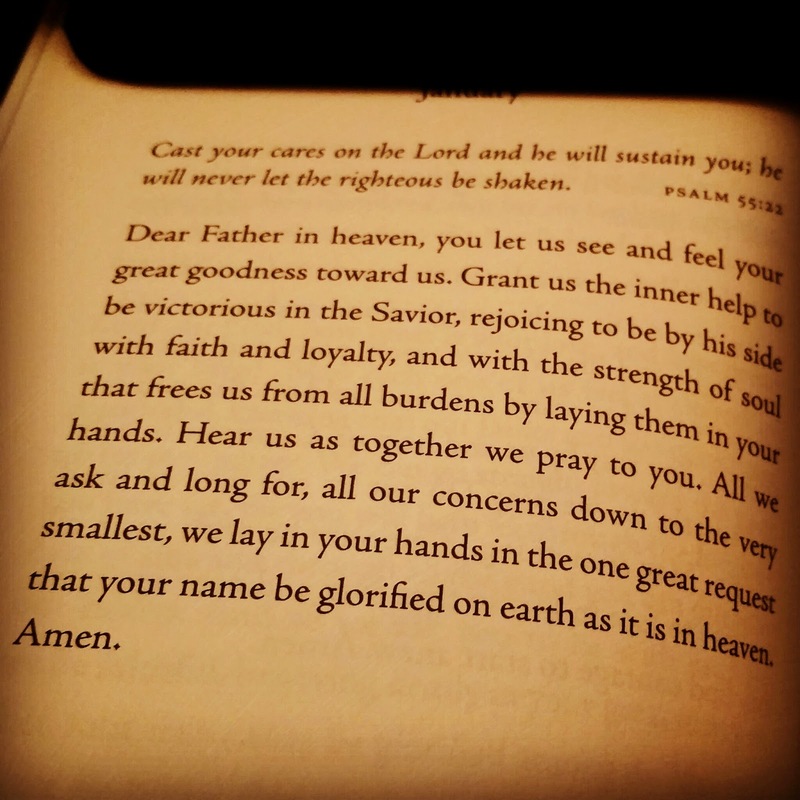 What surprised me was how simple, powerful, and timely these prayers are. They were written 100 years ago! But, of course, God's word is timeless and timely, too. I love the simple faith displayed in these prayers, and I find myself praying some of the lines over and over. They just hit directly at the center of what I would have prayed if only I'd thought of it. I also love that Blumhardt doesn't use a lot of flowery language in his prayers - just honest, heartfelt, simple words that mean so much. "All we ask and long for, all our concerns down to the very smallest, we lay in your hands in the one great request that your name be glorified on earth as it is in heaven." This is a book that I plan to turn to and use often, and I'd definitely recommend it to anyone looking for a little guidance in connecting with God in a simple, direct, and meaningful way at the end of the day. This book was provided for review by Handlebar and Plough Publishing.